Kiasu! For anyone unfamiliar with the term, it's a Hokkien word which in a nutshell, means "fear of losing". If you see a form of behavior that makes you shake your head, and wonder what on earth the person is thinking (for example, a fit and healthy 20 something year old elbowing an elderly person aside to get a seat on the train in the morning, before instantly "falling asleep" only to magically wake up at their station), then there's a good chance that you've witnessed Kiasu in all it's dubious glory. 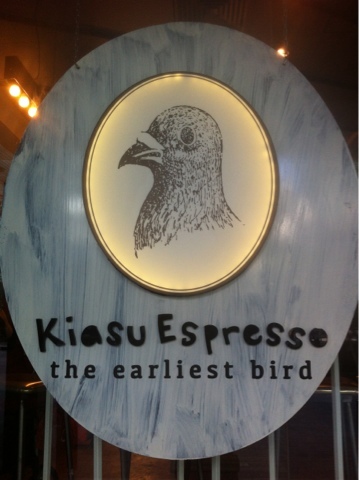 Fortunately, there was absolutely no trace of Kiasu behaviour from the bright young crew of Kiasu espresso in Tanjong Pagar. (Apart from the bird on the logo, obviously. Just look at him, planning on eating all the breadcrumbs before the other birds get a chance to eat. Kiasu bird). 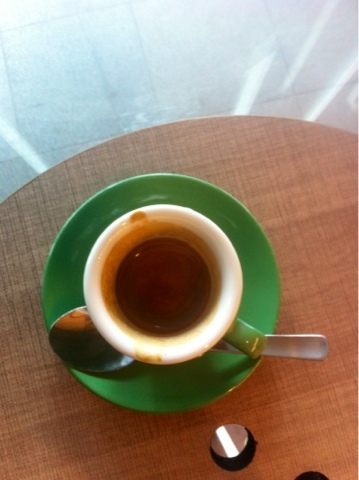 Espresso - a layer of dark red brown crema floated over a medium volume of dark brown espresso. The initial flavours were citrusy, almost to the point of being tart. It's not astringent however, so it's not an unbalanced shot. The mouthfeel is not syrupy, a little loose, but not badly so, and doesn't affect the overall quality of the shot. 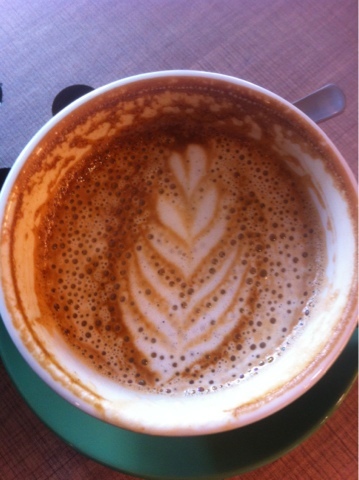 Latte - there was a tempered potency, with a strong espresso aftertaste. The latte was smooth without losing much of the underlying coffee character. The initial coffee hit is muted in subsequent sips, but by no means is it lost altogether. One issue however was the presence of larger bubbles in the foam, which caused the foam to fall apart over time. 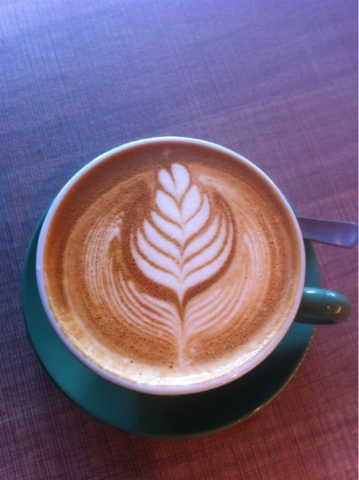 It's a pity, as the intricate latte art was so well executed, and this caused the overall effect to be lost. This would be a more significant issue for anyone whose preference is for cappuccinos, where the ratio of foam to liquid is more larger, and which could subsequently affect the texture and mouthfeel. Overall, it's not a bad choice for anyone whose office is based in the area, and it is certainly preferable to the burnt coffee and bowls of warm caffeinated milk that are served elsewhere. At $8.50 for a regular latte and a single espresso, it's certainly no more expensive, for what is better coffee than the established franchises nearby. However, there are also a number of other independent cafes nearby in Outram park, which consistently serve high quality coffee, and which are near enough to compete for customers. At present, the standard of coffee served is good, but with some small amendments to the execution process, it could be even better.